Pokemon Go trainers will have a chance to catch themselves a Shiny Zapdos on the appropriately named Zapdos Day, July 21. Just announced by Pokemon Go developers Niantic, the next themed Raid Day for Pokemon Go is the Zapdos Raid Day – which will of course give fans the chance to catch the electric-style Legendary Bird Pokemon that made its debut in Pokemon’s first generation (Red/Blue/Green/Yellow). 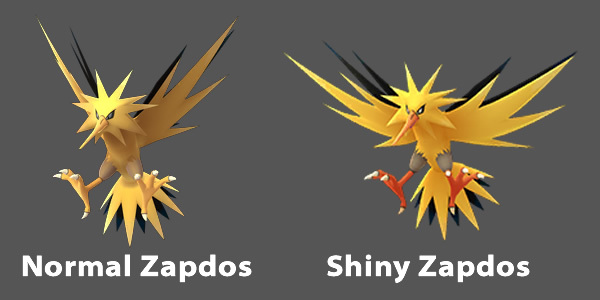 There’s even a chance for Shiny Zapdos to appear, making this a unique opportunity to catch something really, properly rare. Players need to make an effort to complete Professor Willow’s Golbal Research Challenge this weekend – that’s July 14 and 15. Once that’s done, we have to wait for a week – and if we’ve been successful, Zapdos will be the featured raid Pokemon for a limited three-hour window on Saturday July 21. In order to get a shiny Pokemon Go Zapdos, you’ll just need to participate in raids to catch some of the legendary birds and hope for the best – it’s ultimately still down to random chance, but you have a much better shot at it happening this week. If you do catch a Zapdos through this new Pokemon Go event one thing is guaranteed, however: it’ll have Thunder Shock. That’s a strong electric move that can help turn Zapdos into a much more viable beast for battles. So, here’s the thing – aside from being a rare and desirable legendary Pokemon, Zapdos is actually one of Pokemon Go’s Best Pokemon. It ranks fifteenth on our list of the best and most powerful Pokemon in terms of raw attack power in Pokemon Go, and though a few other legendary types are above it, it’s definitely one of the best electric-type Pokemon in the game. Its defense and stamina stats are nothing to sniff at, either. Electric-type is a useful one to have a powerful, buffed-up Pokemon to represent, too – it’s super effective against Flying and Water types and is resistant to Flying, Steel, Electric and Ground-type Pokemon – meaning it’s pretty well balanced for taking into battle against gyms or into other raids. You can read more about that in our Pokemon Go Type Chart and guide. What makes this special Zapdos from Raid Day stand out is Thunder Shock. Shiny or not, the guarantee of getting a Zapdos with Thunder Shock makes participating in this event worthwhile. Thunder Shock has a great potential Damage Per Second – around 10 DPS – and when paired with Thunderbolt or Zap Cannon it can make for the optimum Zapdos setup. As such, it’s definitely worth trying to nab a Shiny Zapdos if you’re able next Saturday. The post Pokemon Go Zapdos Day is your chance to catch a Shiny Zapdos with Thunder Shock appeared first on VG247.